Are Wired Hospitals Losing the Patient Connection? 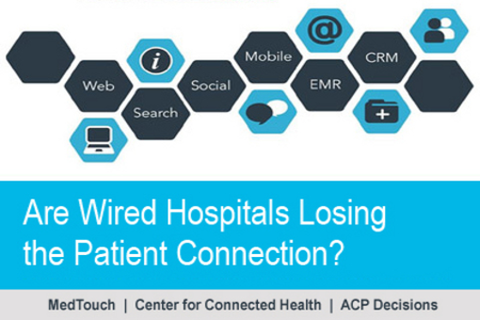 From high-tech to high-touch: are wired hospitals losing the patient connection? This panel of nationally recognized leaders in healthcare has applied technology solutions to enhance quality of patient care across disciplines. The impact of mobile, remote monitoring, the Internet, video education, and patient portals on the patient experience will be discussed. With so many technology tools available is face-to-face interaction with the doctor necessary? What role can patient portals play in improving communication with patients? How do we place the right amount of value on the patient-doctor relationship (high-touch) while improving care delivery and efficiency? We turn to innovators in two healthcare segments – telemedicine and end-of-life care – to find answers, and to a leading provider of online solutions for healthcare to tell us how to effectively coordinate technology tools to improve the patient experience. Dr. Volandes is a faculty member in the General Medicine Unit at the Massachusetts General Hospital and Assistant Professor of Medicine at Harvard Medical School. Dr. Volandes' research is focused on improving decision-making at the end of life and is supported by the Agency for Healthcare Research and Quality, the National Cancer Institute, the National Heart, Lung and Blood Institute, the Alzheimer’s Association and the Foundation for Informed Medical Decision Making. He received his BA in philosophy from Harvard College his medical degree form the Yale School of Medicine, and a Masters of Public Health from the Harvard School of Public Health. Following medical school, Dr. Volandes completed a residency in internal medicine at the University of Pennsylvania. He then completed fellowships in medical ethics at Harvard Medical School and Brigham and Women's Hospital. He was named the Edmond J. Safra Faculty Fellow in 2004-5 at the Harvard University Center for Ethics. Joseph (Joe) C. Kvedar, MD, is Founder and Director of the Center for Connected Health, as well as an avid personal health technology hobbyist and quantified-selfer. The Center for Connected Health, a division of Partners Healthcare, is working to create a new model for healthcare delivery by developing programs and innovative strategies to move care from the hospital or doctor’s office into the day-to-day lives of patients. Leveraging information technology -- cell phones, computers, networked devices, and simple remote health monitoring tools -- the Center helps providers and patients manage chronic conditions, maintain health and wellness, and improve adherence, engagement and clinical outcomes. Viewing the Center as a launching pad for innovation beyond the Partners network, Joe has grown and formalized its Consulting Services to offer product evaluations, expert reviews, advisory services and feasibility trials to companies with a desire to enter the connected health marketplace. Under his direction, the Center developed a connected health technology platform that is the foundation for its engaging clinical programs and which inspired the introduction of the first commercially available connected health employee benefit, for self-management of hypertension. In 2010, Dr. Kvedar licensed the Center’s technology platform and co-founded the personal health technology company Healthrageous, with prominent VC backers including North Bridge Venture Partners, Long River Ventures and Egan Managed Capital. Healthrageous leverages its personal connected health solutions to enable individual journeys of lifelong health, working with large employers, health plans, health providers and health/wellness organizations. He serves as Chair of the company’s Scientific Advisory Board. Joe is internationally recognized for his leadership and vision in the field of connected health and the application of communications technologies to improve healthcare to patients. He is a frequent lecturer and has authored over 70 publications on the subject. Joe serves as a Board member for a number of organizations, including the Continua Health Alliance and the Care Continuum Alliance. He authors the very popular cHealth Blog. Paul Griffiths is Founding Partner and CEO of MedTouch, an interactive marketing and technology-focused professional services firm with four offices nationwide. In his work, Paul sets the overall company strategy for leveraging online assets to engage patients, physicians, and payors. Prior to MedTouch, Paul helped bring brand-based ecommerce to a variety of for and non-profit entities. He is very excited to be at SXSW.